I would put the extend the back through a slot in the base about 2” and reinforce with a batten. Or, build a side like the other end. Not too impressed with the idea of leaving one side in the wind, so to speak, but it does look like 2” thick material. Depends on who’s using it I guess. Not going to be cheap to build—a lot of 8/4 wood there. -- Everything is a prototype thats why its one of a kind!! Unsupported butcher block seems structurally iffy. In any case I would use 3/4” or 1” diameter hardwood dowels places on maybe 6” centers. I would drill in to the back as deep as is feasible and drill through the bottom, and trim. 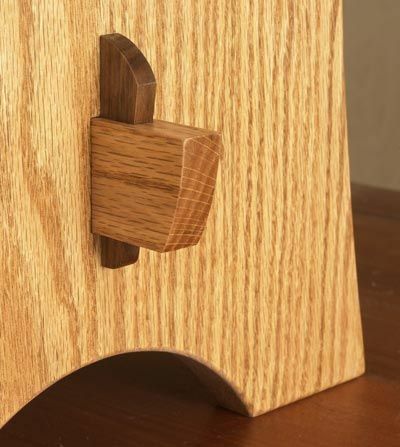 I don’t see how a mortise and tenon would work; a floating tenon would though. I think dowels are easier to do. Like RWE I would be concerned about the unsupported side of the back. -- This post is a hand-crafted natural product. Slight variations in spelling and grammar should not be viewed as flaws or defects, but rather as an integral characteristic of the creative process. I would build a separate base for the sofa bottom cushion. Then raise the table another 6-8” to be more flush with the cushion and wrap that table around the back for support. Then extend the back slab all the way down to the floor. Put the legs in front of the back slab (rather than on the sides) to take the stress. You would be surprised how rigid that slab would be secured on one end with thru loose tenons in the bottom edge. But just for S+G’s I’d put some 1/2” threaded rod thru the slab and seat section and cap it off on top. (maybe 3 lengths). Through mortise and tenons with wooden wedges through them,this way it would be strong but easy to break down and move. It doesn’t look very comfortable but I like the clean lines.